Located between Louisville, KY, and Bowling Green, KY, is an outstanding automotive program that is helping to supply the unquenchable need for industry talent. The Elizabethtown Community and Technical College (ECTC) campus is inviting and warm to the visitor. But it’s what’s inside that should really draw in a student, especially those interested in automotive or diesel repair. 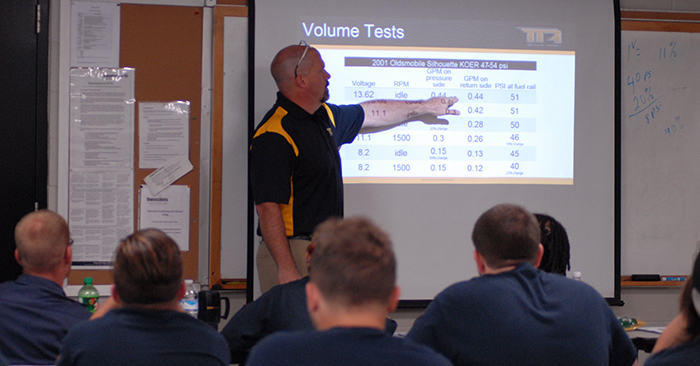 ECTC has both an Associates of Applied Science automotive and a diesel program that are NATEF-certified. The automotive program at ECTC has received several national awards, including recognition by Tomorrow’s Technician magazine. ECTC placed in the top 4 automotive programs in 2017, and they were also recognized in the top 20 the prior two years. Much of the credit for the many awards is the outstanding faculty that truly works continuously to improve the program. The five full-time instructors at ECTC are ASE Master Certified in both Automotive and Medium/Heavy Truck. They carry the L1 certification. I have had the pleasure of delivering an on-site training course at this facility for the past four years. I am always greeted with helpful students that willingly help me to move in the equipment for the course delivery. Having had the pleasure of speaking with Jerry Clemons, the Program Coordinator, and instructors Doug Poteet and John Chism, it only took a short period of time before I could see the excitement they have for educating future technicians. Between the automotive and diesel program, they regularly have 110 to 120 students enrolled. Many of these students go on to attain a 4-year degree at either Western Kentucky University or Southern Illinois University Carbondale. The program has also many leaders in the field of automotive/truck repair. One of these leaders is Jeremy Dones, a gold medal winner in the 2013 Skills USA completion. This program is not only helping to fill the shortage of automotive professional across Kentucky, but it also provides professionals like Shane Redmon, Maintenance Director for the Jefferson County Kentucky School district, and Cole Miller, Service and Parts Director for Swope Toyota, with opportunities. If you are an employer in the automotive or diesel repair industries and are looking for a quality employee, I would highly encourage you contact Jerry and his outstanding, qualified staff of instructors to see if they have a student that can fill your needs. However, don’t waste time because their students are in demand and always have a job waiting.